The HemoCell framework is available as source code or as singularity image under the AGPL v3 license (for details see the file LICENSE in the package). The code can be compiled on Linux, Mac OS X and Windows 10 using the linux subsystem extension. The framework was built using C++ & MPI with efficiency in mind. It has been proven to have excellent scaling properties. Both single cell mechanical behaviour and blood rheology were compared to experimental results! See this paper. Adding new material models and cell types is simple! See this paper. Data is stored in compressed HDF5 files, suitable for parallel access and ready to be visualised! 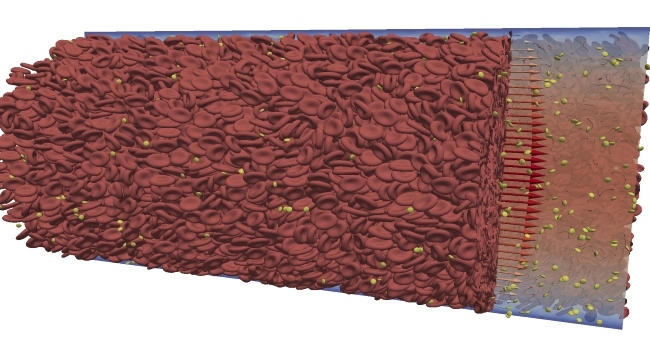 A validated two dimensional lattice Boltzmann model for blood plasma with a discrete element method for both red blood cells and platelets coupled by the immersed boundary method. We believe that by allowing free access to the community we can further inspire development and distribution so that a large number of scientists can benefit from its capabilities. We hope that you will also find the software useful and encourage you to contribute enhancements and improvements back. If you have questions or remarks about HemoCell, please contact us via e-mail! Our official mailing list is a low-requency list (1-2 mails per year) created to inform users and potential users about important new features and other significant changes. 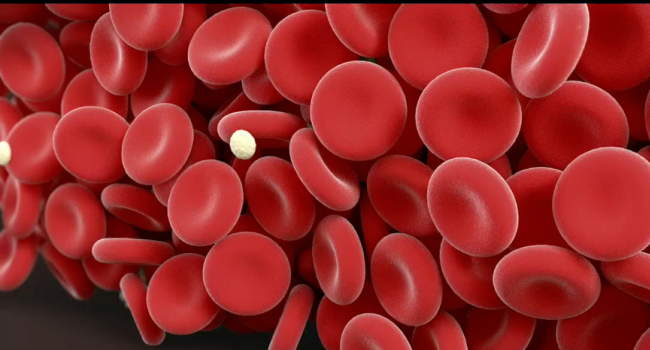 Simulation data produced by HemoCell was used in the creation of the Virtual Physiological Human IMAX movie. It is an educatory movie targetting the general public and aims to show the current state of the art models building up the Digital Twin. The movie is available here. 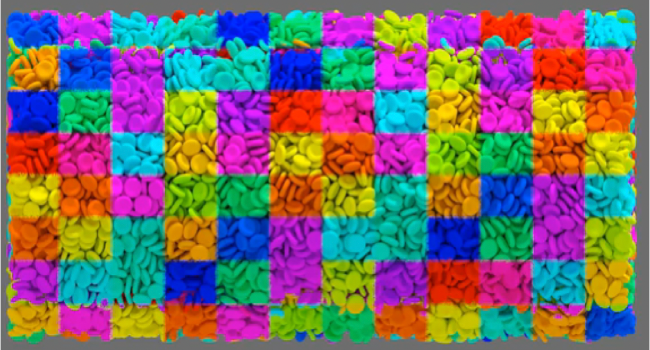 The material model of the cells and the fluid structure interaction between the cells have been validated thoroughly. The standard experiments for the comparison are optical tweezer stretching, consant-shear Wheeler test, size of cell-free layer, apparent viscosity in glass tubes. For details on the validation and the material model please consult this paper and this paper. 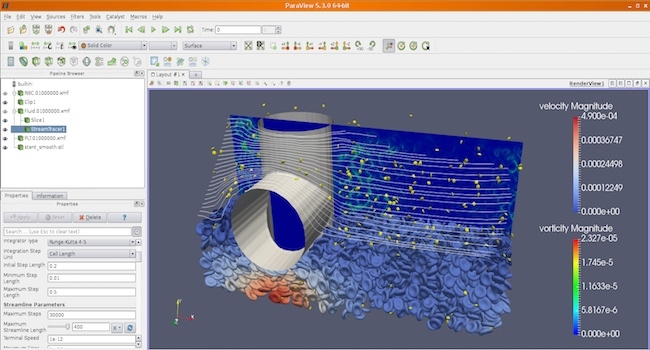 The output of the simulation (compressed HDF5) is directly readable by most visualisation software. Apart from this, the software provides various python scripts to process and visualize the output. During the simulation a reduced set of data is saved as well in CSV format to provide information on the actual state of the simulation. 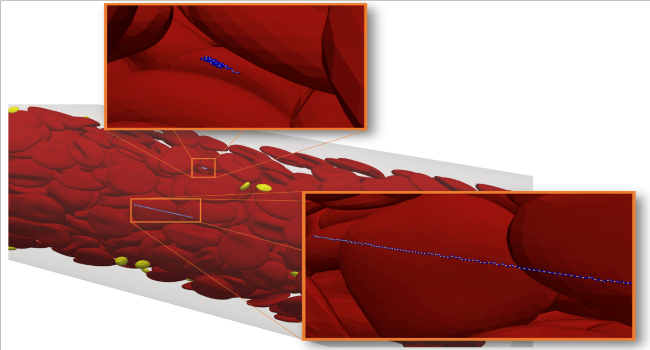 To represent the higher inner cytoplasmic viscosity of deformable cells an fast algorythm is implemented to identify fluid nodes inside the cell and assign different viscosity to them. The application of this feature imposes about 4-5% performance penalty only. For details please see this paper. 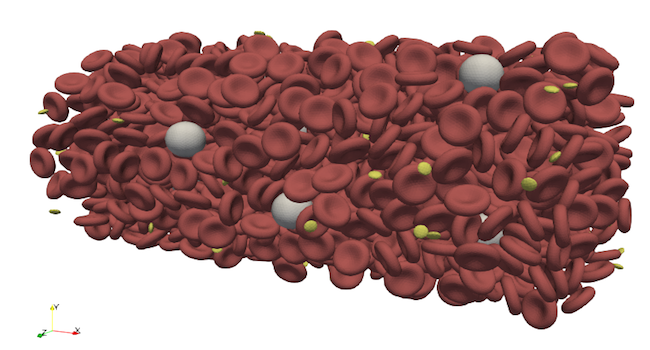 HemoCell forms a core component of the Virtual Artery, a strongly multi-scale system. E.g. it has been coupled to the detailed mechanical simulation of vWF chain uncoiling. The mechanics of the vWF chains are described on the nm scale, while cellular events take place on the um scale. Many interesting cellular phenomena, such as platelet trafficking, can only be observed indirectly in experimental settings (e.g. through platelet adhesion rate). 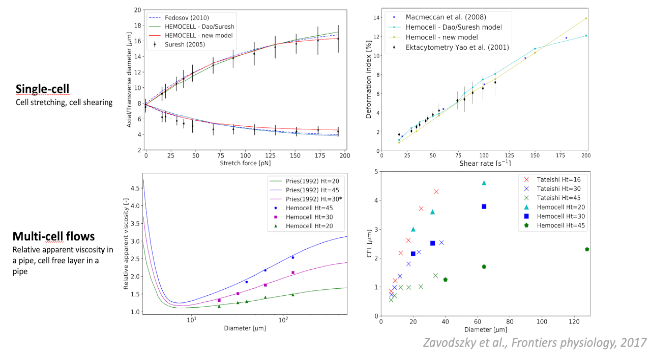 The detailed modelling capabilities of HemoCell are designed to fill in these gaps by yielding the same secondary observables, while also providing detailed information on the underlying processes. HemoCell is also used to examine the deformation of cells around micro-medical devices or obtacles in microfluidic chips. This helps to test and optimise the geometry and to plan further modifications. In the figure we show cellular deformation around the struts of a flow diverter stent. 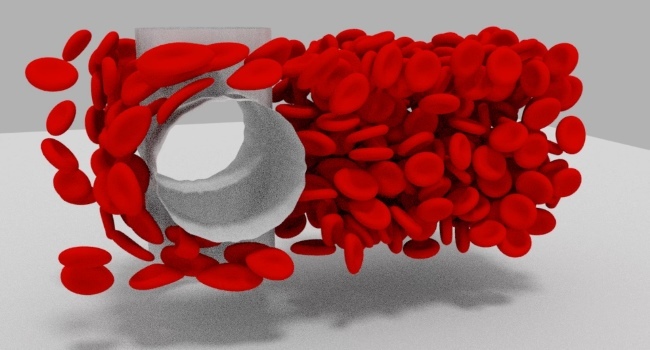 HemoCell is built using C++ with a clean API and heavily optimised algorithms. While it can be executed on a single notebook for smaller scenarios (i.e. 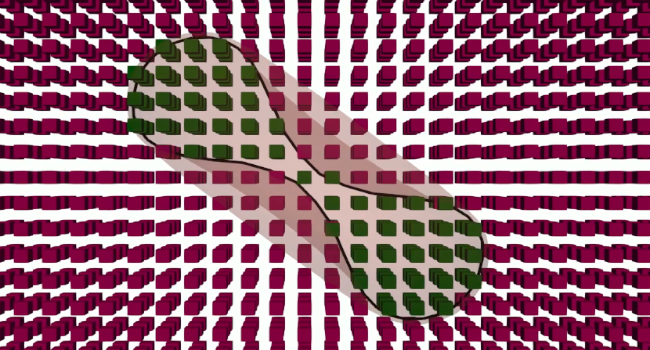 single cell mechanics or two-cell collisions), the target usage is supercomputer execution. The framework provides effective automatic parallelisation as well as dynamic load-balancing using the (optional) ParMETIS library. HemoCell provides a platform that is easy to extend with additional mechanics and new celltypes. Currently, we are working on lymphocytes with cell core mechanics, sickle cells, and malaria infested cells. These will gradually become part of the open source distribution after the relevant papers are published. All rights reserved, Amsterdam, 2018. This site was created by Gábor Závodszky using Hugo and the Hugo-creative-theme.